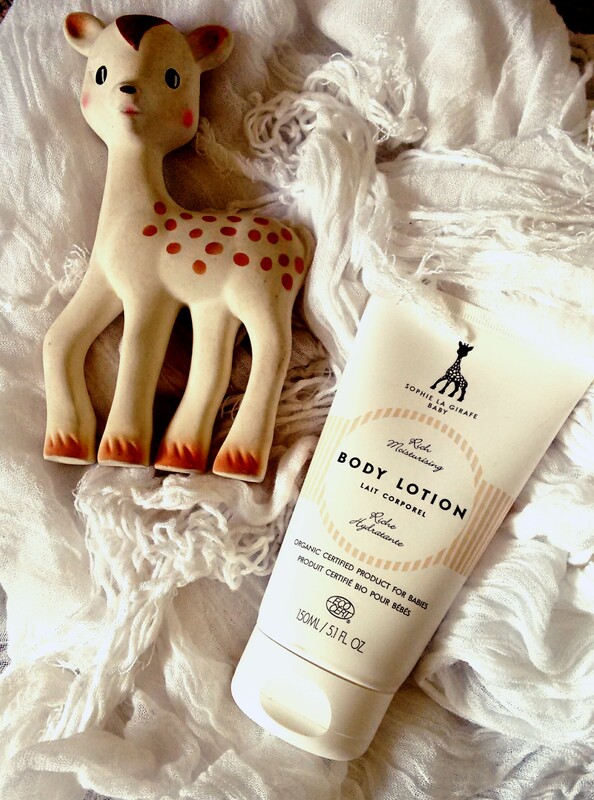 Sophie la girafe skincare products are gentle enough for the whole family, while aimed at babies and young children, I have to confess that I adore their natural baby oil and indulgent body lotion. The entire range is Ecocert certified Organic, which means the products contain at least 95% natural products, and absolutely no parabens. The Ecocert label, means you can be sure that it contains no harsh chemicals, and instead contains fabulous natural ingredients. We’ve been using Sophie la girafe products since Yo was born, and we love the gentle natural fragrance – described by my 5-year-old as “a comforting, gentle almost sweet smell”. The children and I use Sophie la girafe Hair and Body Wash, it works well as a shower gel, or as a gentle bath foam – think super soft bubbles! A little bit, goes a long way and it only foams lightly, so it’s easy to rinse off even when applying with a natural sponge! The body lotion is wonderful for calming tired children pre-bedtime, and we have a routine where they pop some on their legs and elbows every night before climbing into pyjamas! I struggle with very dry skin, which is often quite sore especially in the winter months, and I’ve discovered that Sophie La Girafe Body lotion, not only helps keep my dry skin under control, it also doesn’t irritate my sensitive skin. Next week, it’s #OrganicBeautyWeek, and Sophie La Girafe have offered one of my readers the chance to win a wonderful Sophie La Girafe gift set to celebrate! Previous PostFamily Theatre in Hampshire Autumn 2016Next PostBudgets, Bargains and Beds: Redecorating your Home for Less. If I won this i’d give it to my sister she has two little ones and works full time so deserves a bit of luxury! I would love to give this to my cousin who is currently pregnant and expecting to give birth very soon! id love to win for my new niece ! I’d give this to my sister in law, she loves Sophie products for her little one, I’m sure she would love this too. Would like to win this for my sister’s birthday! Love this for my son. Sounds so very interesting. I would give it to my friends who have just had a baby girl. My little boy. He loves his Sophie the giraffe teething toy! One of my best friends is expecting her 3rd baby (a girl) after 2 boys – the youngest is nearly 12. So I am putting together a hamper for her. I would love to win for a good friend that is having her first baby! For my little baby boy! My sister, she has just had her second child and deserves a treat! For my friend’s little one. My very heavily pregnant best friend. Our wee one, who is due next week! I’d give it to my friend as a gift when she gives birth early in the new year. Would love to win for my first baby due very soon ! I am sure he would love her !! I am a first time mum and heard nothing but great reviews on this product so is on my very long to buy list ! Would love to win this for myself, as our new addition is due in November! Thanks for the chance! my little niece arianna would love this. I’d like to win this prize to give to my nephew. Would love to win this for my friends little baby!